And yes, Dixon said, thoughts of repeating as champions in IndyCar were fading as the team left the Toyota Grand Prix of Long Beach a week ago in 17th place in the point standings. But Dixon, who also was the winner of last year’s Indianapolis 500, knew something else. He knew he had a great team behind him and that it just needed a good finish at Kansas Speedway this weekend to turn the situation around. Dixon got better than a good finish in Sunday’s Road Runner Turbo 300 in Kansas – he and his team got a victory. He led a race-best 135 laps. He earned 52 points and jumped to fourth place in the standings. He will head to Indianapolis for the month of May just 19 points behind leader Tony Kanaan, who finished third on Sunday. The start to Dixon’s season was as puzzling as it was troubling for him. Dixon is a road racer. One of the best in the world. And with the first two races of the year on street courses – in St. Petersburg, Fla., and Long Beach – you had to figure that a strong start would be automatic. Dixon had it figured that way. “Road courses and street courses, to be straight up, are my favorite races,” Dixon said. “To have pretty much two DNFs at the last two has been very frustrating. It hurts you in many areas. Dixon, who started from the fourth position at Kansas, stepped to the front on lap eight. That’s when he passed pole-sitter Graham Rahal for the lead. Ryan Briscoe took the lead from Dixon once – in the pits – and held it for 43 laps, but Dixon took it back with 45 to go and won by .7 seconds over Helio Castroneves. And thoughts of the possibility of a season gone awry were blown away in a gust front of Victory Lane confetti. “We needed something,” Dixon said. “You know, even a sniff of something because so far, all we have had is a sniff of the tail end of the field. I was starting to look back on 2004 and how that was a dismal season as well. Also getting a nice kick of confidence was Castroneves. Two weeks ago, he was sitting in a court room wondering if he would spend the month of May – and many months after that – in jail because of tax-evasion charges. A couple of days before Long Beach, Castroneves was acquitted. On the day of Long Beach, he was in a race car competing. At Kansas, Castroneves was able to get back into his race weekend routine and that felt great, he said. And inside the car during the race, Castroneves said, his rhythm returned. “Through the whole race, slowly but surely it was my rhythm coming back,” he said. Everything was not perfect for Castroneves on Sunday. He rammed the rear end of Vitor Meira’s car 15 laps in to bring out the first caution of the day. But Castroneves’ Team Penske crew put a new nose cone on the car during a pit stop and the podium run was back on. Kanaan now leads the series with 100 points. 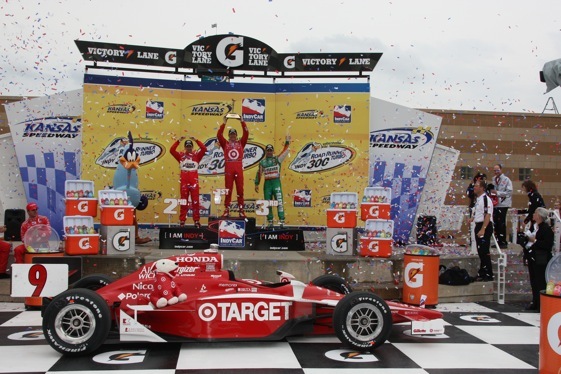 One point behind him is Briscoe, who finished fourth Sunday, and three points behind him is Dario Franchitti. Franchitti, who was the points leader heading into Kansas, crashed on lap 153 and was credited with an 18th-place finish.